If you are wondering where it is, it is right there in Hainan, China. 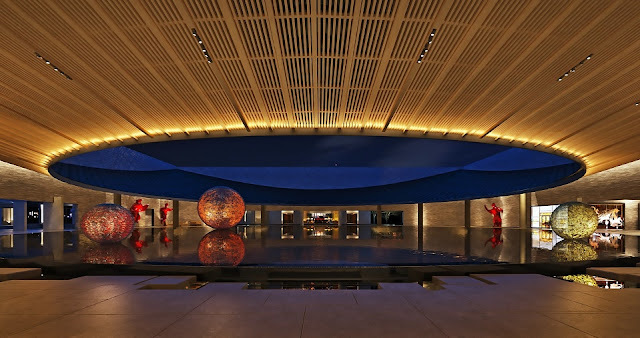 A new chapter in the fabled history of China’s ancient Maritime Silk Road is written with the imminent opening on Capella Sanya. The private sanctuary promises to “set a new benchmark for China’s luxury beach resorts” – inspired by the legendary voyages of seafarers trading between China, Southeast Asia, India, the Arabian Peninsula, Somalia and all the way to Egypt and finally Europe between the 2nd-century BCE and 15th century. Capella Sanya – a collaboration between one of the world’s pre-eminent luxury brands Capella Hotel Group and Chinese developer China Gezhouba Group Real Estate – pays homage to a Silk Road legend surrounding its location in secluded TuFu Bay on the southern coast of tropical Hainan Island. China’s southern island of Hainan was a major transit point for the trade in merchandise from silk, porcelain and lacquerware to spices, rosewood and Lingnan-style bronzeware. And it was here, in the 14th century that Persian traders reputedly sheltered from a devastating typhoon before earning a fortune from their precious cargo and naming the haven “Blessed Bay”, translating to TuFu Bay in Chinese, in gratitude of their lucky escape from calamity. Themed and designed as a “collaborative art piece” by two of the world’s most celebrated, visionary ‘starchitects’, Jean-Michel Gathy and Bill Bensley, it is one of the hospitality industry’s most-anticipated openings in 2018. “With the combined creative genius of Jean-Michel Gathy and Bill Bensley, Capella Sanya guests will enjoy a variety of meticulously crafted experiences on a themed journey across the New Silk Road,” said general manager Yngvar Stray. Details will not be unveiled until the opening, scheduled towards the end of this year. But along with Capella’s renowned for spectacular, luxurious hospitality, landscape design and recreational facilities, the legendary trade route is referenced from grand design to each section of the extraordinary journey. A traditional Chinese tea house symbolises the start of the Silk Road, and a destination spa at the other, with a Moroccan hammam, snow cabin and treatments inspired by Eastern traditions, and the complex tastes of culture along the maritime Silk Road offered by six distinctive restaurants, where the calm azure sea meets the golden sand. Unwind and find peace private sanctuary, or wander the endless space offered by this idyllic resort. Just 45-minutes from Sanya International Airport, Capella Sanya offers 190 exquisitely-designed rooms and villas amid lush gardens, overlooking the South China Sea. Inspired by the beautiful elements of nature and the area’s famous and often mysterious Maritime Silk Road trade history, the accommodation blends contemporary comforts with multiple opportunities to enjoy the peace and seclusion of the resort as a whole. Private pools, terrace dining, dedicated Capella service and modern international dining set the scene for a retreat on the beach. Capella Sanya is open for reservations from November 15, 2018. To book your stay, please visit http://www.capellasanya.com, or contact our reservation team at reservations.sanya@capellahotels.com. Capella Hotel Group, headquartered in Singapore with offices in China, Europe and USA, offers global hospitality management services through two distinct brands. Learn more at www.capellahotelgroup.com.